The Salt-Away Gallon Concentrate can be mixed with up to 512 gallons of water. The standard ratio is 1 oz. 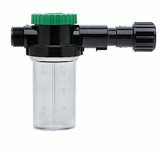 to 4 gallons of water but concentration can be doubled for tougher applications. This container can be used to refill the mixing unit or you can premix in bulk if you prefer. 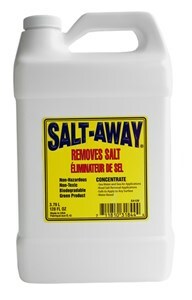 Salt-Away will actually help remove all of the salt deposits from the surface. Plain water will not remove all the salt. Salt-Away is water based, and when mixed with water, removes salt more completely. Salt-Away is designed to remove salt from just about any surface. It can be safely used on metal, paint, fiberglass, glass, rubber, plastic, chrome and many other surfaces. It doesn't contain solvents so it won't remove wax or other surface protection. A. No, Salt-Away is to be mixed. It should not be used in concentrated form. A. When you use Salt-Away, the salt is rinsed away in the water. This product doesn't make salt disappear. Salt-Away greatly enhances the ability of the water to rinse the salt away. Q. Can I use a rust inhibitor after using Salt Away? A. Yes, if you have an unprotected metal surface, applying a rust inhibitor after using Salt-Away will help you protect the surface.